positive check: The Heavy Plough and the Agricultural Revolution in Medieval Europe. Did the heavy plough – as suggested by Lynn White Jr. and many others – lead to economic development during the Middle Ages? This question is investigated in a new EHES working paper by Andersen, Jensen and Skovsgaard, University of Southern Denmark. During the Medieval epoch the heavy plough spread across Europe. 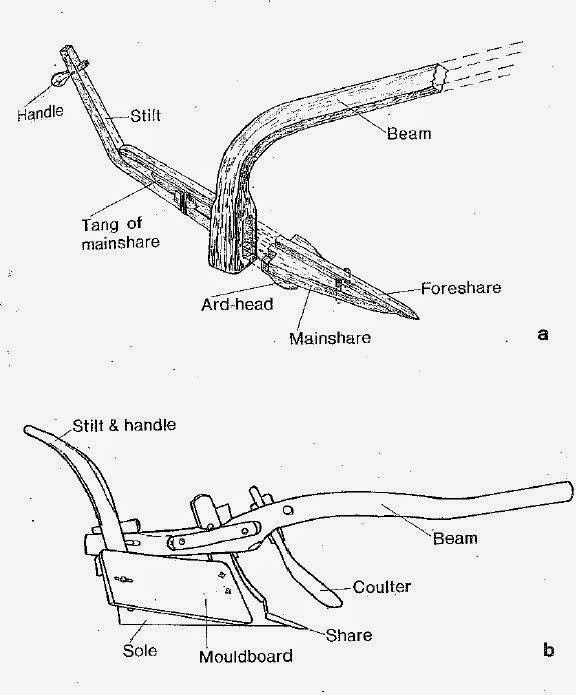 Heavy ploughs had a number of advantages compared to the old plough known as the ard (see Figure 1). These advantages derive from the addition of the mouldboard, which was used to turn the soil. By turning the soil, high-backed ridges were created. This was useful on poorly drained clay soil, as the ridges improved drainage. Turning the soil also improved weed control on these soils, since the ard provided insufficient damage to root system. Other advantages include e.g. bringing up lower level soil in which percolating water tended to concentrate plant nutrients. Hence, by allowing for better field drainage and access to the most fertile soils, the heavy plough stimulated food production and, as a consequence, “population growth, specialization of function, urbanization, and the growth of leisure” (White 1962, p. 44). It is widely believed that the new plough had its breakthrough around AD 1000. Andersen, Jensen and Skovsgaard use this breakthrough year and the regional distribution of clay soil in a difference-in-difference setup in order to investigate whether the heavy plough did in fact lead to increased economic development after AD 1000 in areas that stood to benefit the most from the new technology. Fig 2: Clay soils and the establishment of towns in Denmark. Using establishment of towns in Denmark (see Figure 2) and cities in Europe as a measure of economic activity, the paper shows that regions more suitable for the heavy plough developed more strongly after its breakthrough (see Figure 3). In the study of Denmark the heavy plough explains more than 40 % of the new towns established between AD 1000 - AD 1300. In the case of Europe it explains more than 15 % of the new cities during the same period. Overall, the paper corroborates the hypothesis that the heavy plough mattered for economic development. This suggests that increases in agricultural productivity can be a powerful driver of development. The blogpost was written by Christian Skovsgaard, PhD Student, Department of Business and Economics at University of Southern Denmark.